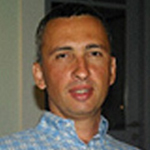 Dr. Vangelis Karkaletsis is the head of the Software and Knowledge Engineering Laboratory (SKEL) of the Institute of Informatics and Telecommunications at NCSR "Demokritos", and responsible for the Institute's educational activities. His research interests are in the areas of content analysis, human-machine interfaces, ontology engineering. He is scientific manager of the H2020 project Your Data Stories (http://yourdatastories.eu/) on the analysis of open governmental data and their linking to social web. He is also site manager for the H2020 Big Data Europe project (https://www.big-data-europe.eu/) for the development of a Big Data Integrator platform, and coordinator of the H2020 Radio project (http://radio-project.eu/) on the use of robots in assisted living environments. He has organised international workshops, conferences, summer schools. He teaches for many years at post-graduate courses on language and knowledge technologies.